Don’t assume that baby squirrel on the ground is in peril. Baby squirrels sometimes fall from their nests; if they're uninjured, their mothers typically return and collect them. However, if you're sure the squirrel is ill or permanently abandoned, the best help you can offer is to get him quickly to a wildlife rehabilitator, and keep him warm and hydrated en route. Always wear gloves and take care when handling wild animals, even baby ones. Squirrel mothers provide the best care for baby squirrels, providing the baby isn't injured. Very ill baby squirrels are cold to the touch, grayish-pink with grayish lips and gums, inactive and thin. They often curl up into a ball. If the baby is pink, fat, round, warm and squirms when touched, allow at least two hours for his mother to find him again. Put him in a high-sided box he can't fall out of, put in a clean T-shirt and attach the box to the tree you found him under, as high as you can, or place it nearby out of reach of predators. Stay out of sight. If the mother doesn't return, or if the squirrel is very ill or obviously injured, contact a wildlife rehabilitator. Wildlife rehabilitators are trained to care for baby squirrels and prepare them for release back into the wild, but you can help keep the baby alive while transporting him to one. Keeping him warm is a priority, so fill a ziplock bag with hot water, put it in a box and cover it with a clean blanket, then put the baby on top of the blanket and half on and half off the bag, which allows him to move off if he gets too hot. Alternatively, a clean sock filled with uncooked rice and tied off, then heated for one to two minutes in a microwave, is also effective. Dehydrated baby squirrels are very ill and unable to digest food. To test for signs of dehydration, lightly pinch the skin over the squirrel's shoulders -- and don't forget to don thick gloves first. If the skin doesn't spring back but remains tented, the baby needs fluids immediately. Either take him directly to a wildlife rehabilitator or emergency vet for treatment for dehydration. Rehydrating fluids such as pedialyte are suitable if you can't get the squirrel to a trained practitioner straightaway, or a solution of 1 teaspoon salt, 3 teaspoons of sugar and 1 quart of water, thoroughly mixed, is a homemade alternative if pedialyte is unavailable. 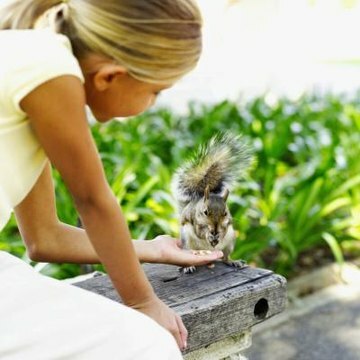 Don't feed a dehydrated baby squirrel as food could kill it. Wildlife rehabilitators feed baby squirrels a specialized milk replacement and stimulate them to defecate and urinate. Other feeds, such as human baby formula, goat milk and cow milk, are unsuitable and could make the baby very ill. Rehabilitators know how much to feed a baby and how to hold him so that he doesn't choke. Babies who are overfed, fed incorrectly or aren't stimulated to void their waste can die. If you're unable to find a wildlife rehabilitator in your area, take the baby squirrel to a vet, who may be able to suggest an alternative.